Imagine a bowl of fire that can have different colored flames and can be kept next to you. Our firebowls are very similar to that. The bowl itself is crafted from Himalayan rocksalt and a bulb is passed over from the bottom. Rocksalt crystals are placed inside the bowl. When the bulb is lit, the transparency of the bowl and crystals produce a magical glow.The crystals can be in the natural shape or crafted as hearts, making them very special. 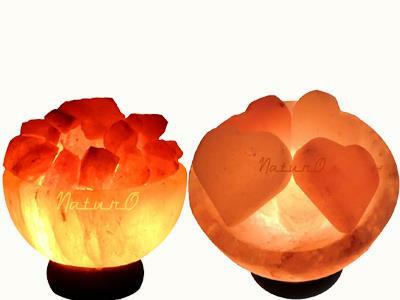 Different colored bulbs produce different types of glows that are very soothing to the mind. Naturo Firebowl is generally placed in the living room, hall, restaurant, office table, etc.